Before the noticeable successes of 2015 disappear from the rearview mirror, it's worth highlighting two dimensions of last year's outperformance in the small commercial property and loan space. First, Boxwood tracked a massive $180 billion of small balance commercial (SBC) loan originations under $5 million in value. This was the highest volume on record, advancing 9% year over year and eclipsing the previous peak of $176 billion posted in 2013. How big a market is this really? Well, the SBC loan volume encompassed a whopping 205,000 new loans split roughly one-third purchase/acquisition loans and two-thirds refinance loans. Need some additional, external validation of the market's tremendous size? - Consider this: The SBC market is approaching the same size as annual sales for our domestic beer market! 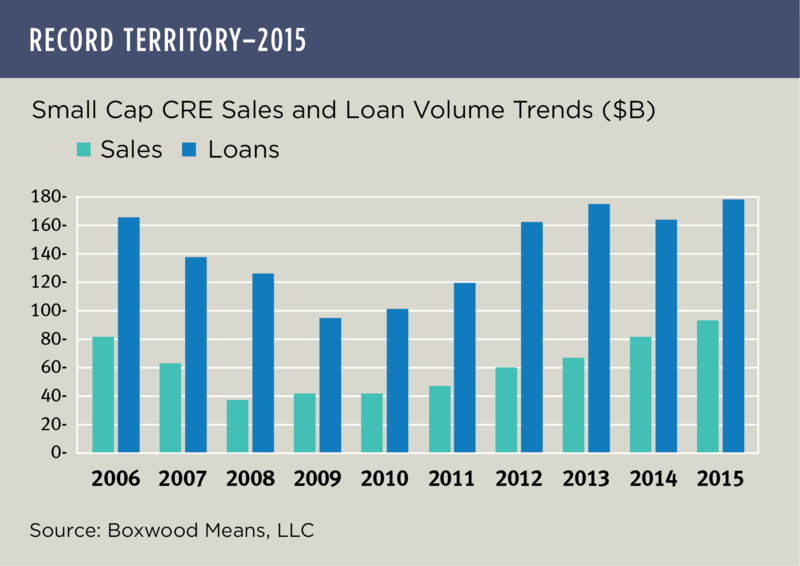 The second highlight of 2015 was the record $93 billion in small cap CRE sales transactions. Asset sales rose 14% year over year to a new high for the second year in a row against a backdrop of solid core fundamentals, cheap debt and a stable, if not improving U.S. economy. Transaction growth wasn't ubiquitous, but still, 93 of the 122 markets within Boxwood's national coverage turned in positive sales volume gains. See the nearby graph showing the symmetry between national property sales and loan volume growth. So raise a glass of your favorite beer and toast all the thousands of small private investors, small business real estate owners and capital providers for making 2015 a stellar year.